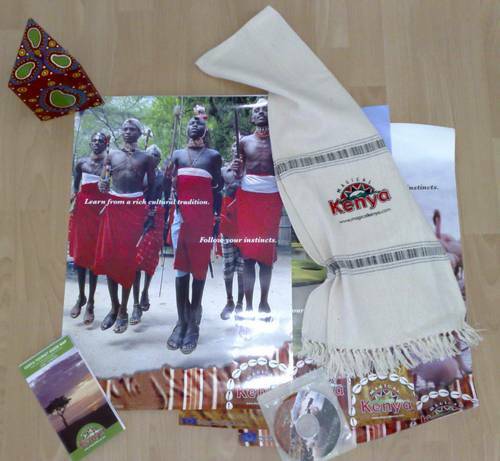 My dear friend Nicky managed to secure this MagicalKenya package from the Kenya booth on the International Tourism Fair in Berlin (ITB Berlin) earlier this year. After resurrecting her iPod Mini with a new battery, she rewarded me with these goodies: some posters, a tourist map, a cd with a promo video on tourism and why Kenya is THE perfect holiday destination and something like a scarf that reminds us of a Kikoi, or maybe also of that drapery one often finds underneath the TV & VCR setup at a typical middle-class home. Neat! As mentioned earlier, the ability to instruct this phone to go online over a wireless broadband connection such as UMTS (3G), HSDPA (3.5G) or even my local Wi-Fi (at home & at work) and downloading all this content by itself – without any other computer in between – is just very very sweet. 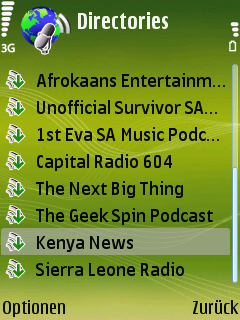 These days, I hardly ever get to watch TV, so being able to pull the desired content from the net “on the go” is just a great help.